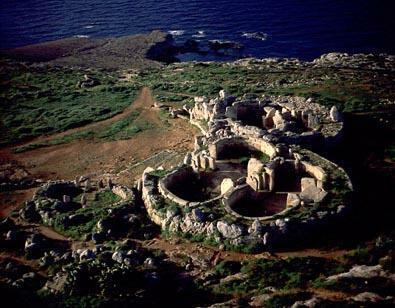 About: Mnajdra megalithic temple complex, dating from around 3000 BC, is one of the most ancient religious sites on Earth. It consists of three conjoined but not connected temples: the upper, middle and lower/South. The arena within the Mnajdra temples is believed to have been a place where people congregated to attend to religious ceremonies. Many artifacts were recovered from within the temples suggesting their use for religious purposes. The most impressive of the Mnajdra temples is the lower or southern/western temple, also called the Solar Temple due to its significant solar alignments for both solstices and equinoxes. How to get there: Take a direct bus to Hagar Qim Park from Valletta and then walk to the Mnajdra temples. 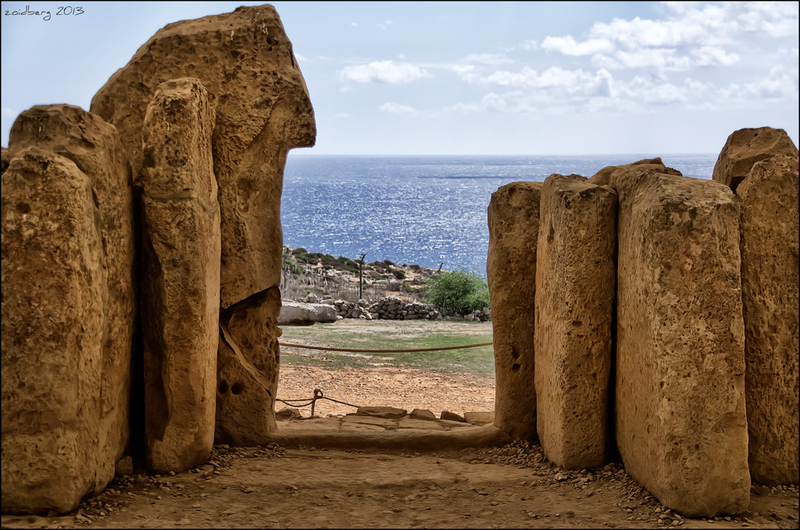 Heritage Malta organizes the equinoxes as well as the solstice observances at the site. Below is a video at the Mnajdra Temple showing the spring equinox sun shining a beam of light inside the temple. This event is not run by The Spiritual Sun. Please contact Heritage Malta if you would like more details about the site such as opening times, admission tickets, restrictions etc. The Mnajdra Temples consist of three interlocked temples. The Third Temple has the Equinoctial alignment and two Solstitial ones. In 1981 I discovered the Equinoctial alignment is marked by a row of standing stones. I found three such, then I was warned to leave the area due to explosives being detonated inat a quarry upon the hill behind the Temples. Some years later some crazy hunters of song birds attacked the Mnajdra Temples, bringing down several stones. Still later a white protective shell was drawn over the Temples. The second Trilithon of the Third Temple is situated somewhat lower than the first, so that only the altar is illuminated by the solar light. Only a few visitors are now allowed to witness this phenomenon. And don’t miss the Libation stone. Surely you should have noted that peculiar Sacred Stone! Thanks for your research here Lucia. Over 5000 years old… that’s just amazing. There’s something special and beautiful about the Sun’s rays entering a building like that, especially on the solstices and equinoxes. Perhaps because there’s something symbolic to it that can be felt. Like the light of the spiritual sun shining into the house of clay of the person, enlightening and animating it. Very well done video, I enjoyed watching that. It even gives a good overview of the site’s plan now. Would be great to see more videos like that on other sites. I know many sites in the UK were build gradually, reworked or added onto over time. I love the energy of this place (what I can gather from the pictures). Feels like a mysterious, ancient place. How interesting that it aligns with all the four important stages of the sun year, whereas I understand it is more common for sites to align with just one or two. The ones who built these were probably a spiritually powerful people. Thanks for the research Lucia! That’s interesting, somehow, I didn’t pay too much attention to the dots on the stones! This is so interesting! Thanks Lucia for this research – looking at the stones, what I found intriguing is all the dots – they reminded me of the seeds found on the Sunflower flower – as they all seemed to be equally displaced as if following sacred geometry principles. It just felt looking at it like it was meant to be reminded of all these Principles/Laws that nature around us can teach us and the intelligent design behind it all..
All in all, a stunning Solar Temple! Would love to go visit one day.